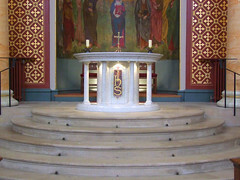 Bury St Edmunds was one of the cradles of Catholic Christianity in England, its shrine Abbey of St Edmund third only to Canterbury and Walsingham as a goal of pilgrimage. At the Reformation, the great Abbey was destroyed, and was not allowed to become a Cathedral. Otherwise, Bury could, today, be a Cathedral city like Norwich, Ely or Peterborough. During the long, dark penal years, the Faith was sustained in Suffolk by Priests in the Bury area. These Priests, at considerable risk of a grisly public death, were generally sustained by recusant families in the area, either the Gages at Hengrave, or the Rookwoods at Stanningfield. 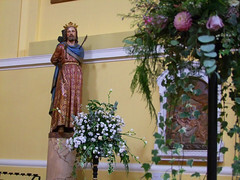 Our Lady and St Joseph at Coldham Cottage, Lawshall, on the edge of the Stanningfield estate, survives as a Catholic parish church to this day. In Bury itself, a group of brave Jesuits established a school in the Abbey grounds in the years after the Restoration, only to be put to flight by the 'Glorious' Protestant Revolution of 1689, when the Catholic James II was deposed in favour of the Dutch William of Orange. Catholic Priests continued to be active in the Bury area throughout the 18th century, providing a ministry to the rest of Suffolk, still at no small risk until the Emancipation Act of 1780. In 1768 they risked building a chapel behind the presbytery, and in 1791, it became possible to officially licence this for public assemblies. 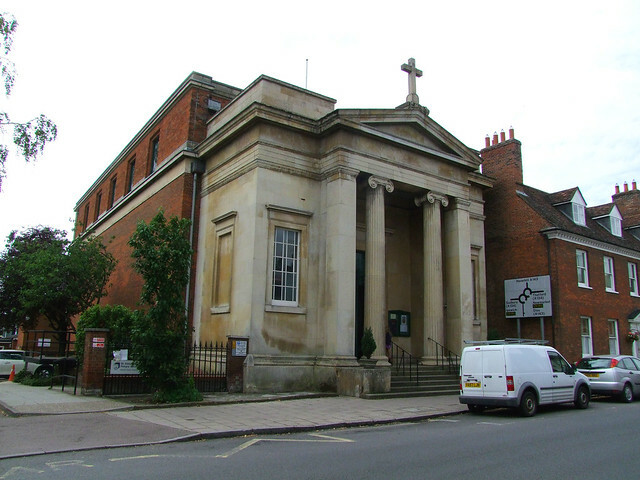 In the 1820s, Catholics were, at last, allowed unlicensed free assembly, and it was not long before the church of St Edmund was built in 1837, the first new large Catholic church in East Anglia since the Reformation. 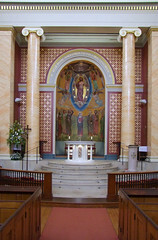 St Edmund's setting is wholly urban, as are the settings of all Bury's churches. 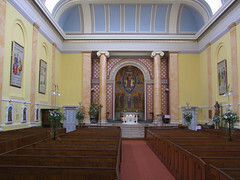 The church is aligned north-south, with liturgical east at the south end. It is built in the Grecian style, that most pure of Classical forms, and the architect was Charles Day. The rather severe frontage has recently been cleaned, and consists of two Ionic columns flanking the great west door. You step inside to a substantial porch area, reminiscent of a great 1930s cinema; one almost expects to see a ticket booth. The interior doorway is most curious, with two classical figures supporting a large marble pediment. Pevsner says that it is a former fireplace surround from the now-demolished Rushbrooke Hall. 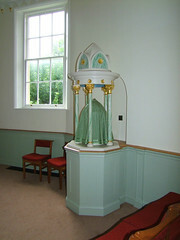 The inside comes as a surprise, for this is Suffolk's only Catholic church with box pews. They are the original set from the 1830s, and are a delight, their mellow uneven facings breaking up the otherwise rather sombre and opulent Classicism of this great church. 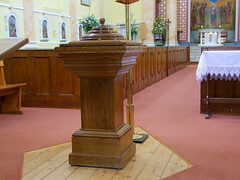 The modern wooden font sits at the north end of the central gangway, but one's eyes are drawn irresistibly towards the great sanctuary. Behind the altar, a gorgeous mosaic of the Ascension dates, I think, from an 1870s reordering. In keeping with the solemn grandeur, the Stations of the Cross are large and sombre. However, the beautiful art nouveau lamps rather relieve this. 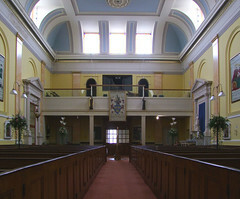 A gallery at the north end contains the organ.Two grand doorways were also taken from the demolished Rushbrooke Hall and pressed into service on either side of the nave. 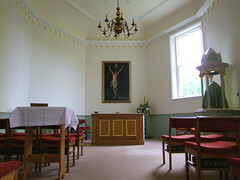 The one in the north-west corner leads into the Blessed Sacrament chapel, the original 1768 chapel. The primary school sits to the east of the building, with the towering heights of the famous Greene King brewery beyond, makers of Abbot Ale. With a regular Sunday Mass attendance of over 800, St Edmund has one of the the largest congregations of any church in Suffolk.